Inspired by the infamous Plame Affair, in which US journalist Judith Miller was jailed for refusing to reveal sources pertaining to a story that leaked the name of a covert CIA operative, director Rod Lurie’s latest offering is a suspenseful, compelling and eminently believable affair. In the aftermath of a botched attempt on the life of the US president that was tenuously linked to Venezuelan militants, Capital Sun-Times reporter Rachel Armstrong (Kate Beckinsale) is hours away from breaking the biggest story of her career. In the piece she names Erica Van Doren (Vera Farmiga), a seemingly unremarkable ‘soccer mom’, as an undercover CIA agent responsible for denouncing the American government’s retaliatory attacks on Venezuelan military targets. Coincidentally, Erica’s daughter attends the same school as Rachel’s son, and though the two women have had no prior contact this does little to engender Van Doren with a great deal of trust on the part of the CIA, who suspect her of being responsible for the leak. Following a contempt of court ruling for refusing to name her sources on the contentious piece, Armstrong experiences the full might of US governmental wrath in the form of gung-ho FBI prosecutor Patton Dubois (Matt Dillon), who pushes for a jail term and harsh fines for her employers until such time as the source of the leak is revealed. Despite the best efforts of Rachel’s lawyer (Alan Alda) the judge concurs, and thus begins a lengthy battle between journalistic integrity, First Amendment rights and post-9/11 counter-terrorism laws. To divulge the name of an undercover agent is an act of treason, and to refuse to identify such an informant if required by a Grand Jury is a criminal act on the part of any journalist involved. The real life case of Judith Miller makes for fascinating reading. Despite being jailed for over three months she refused to divulge her source naming Valerie Plame as a CIA operative, believing that to reveal confidential sources would violate the integrity of the entire journalistic profession. The motives of the unnamed source were also highly suspect, as a mere two weeks prior Plame’s husband, a political correspondent, had published a series of articles highly critical of US foreign policy. 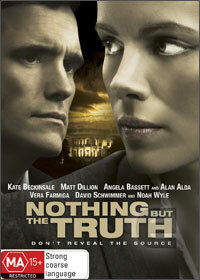 Denied a theatrical release when the film’s distributor filed for bankruptcy, Nothing But the Truth garnered positive reviews following advance screenings and its eventual release on DVD in mid-2009. Beckinsale does an admirable job as the woman torn between motherhood and her professional convictions, and the toll taken on her husband (David Schwimmer) and young son engenders a palpable sense of loss and desperation as the saga unfolds. Her decisions also have profound and unexpected repercussions, though the first rate ensemble cast keep things from getting too unrelentingly heavy. With some extremely deft performances and an engrossing and timely premise, this worthwhile political thriller is a definite success for the beleaguered Lurie. The excellent special features also ensure that despite of its distribution problems, Nothing But the Truth is, in all honesty, one worth staying in for.